At the end of the 1870s, Ireland was on the brink of another crisis. Crops had failed for four years running, but rents had not come down, and so many tenant farmers were evicted from their lands. As a result, the National Land League was established in Ireland in 1878. It was led by Charles Stewart Parnell, who was also a Member of Parliament in Westminster, representing the Irish Home Rule Party. At this time the Liberals under William Gladstone held a slender majority in parliament, and the support of the Home Rule Party was the key to retaining power. Gladstone was sympathetic to the conditions in Ireland in any case, and pushed for reform of land ownership and tenancy in Ireland. 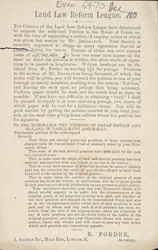 The Land League for its part had only three policies: fair rent, fixed tenure and free sale of land. This leaflet was evidently written in the run-up to the first land bill of 1880. It treats the issue of fixed tenure ("pension") specifically, complaining that rents had been paid to landlords - and thereby into the coffers of the British government - for hundreds of years with no hope of repeal. The leaflet holds that this situation is unethical and must be remedied by parliament.